Xbox LIVE Hub getting revamped with Mango? Looks like Microsoft may be retooling the Xbox LIVE hub a bit for Mango as well, though they are mum on the details at the moment. The image to the left was taken by us during a MIX11 session today. 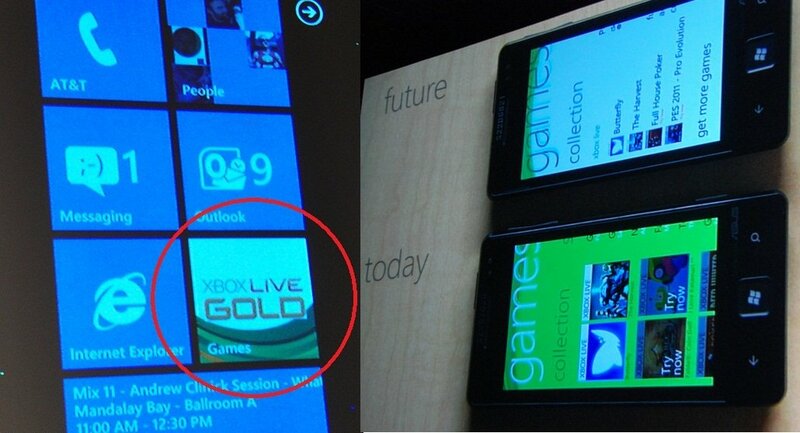 Denoting Xbox LIVE Gold Status, the change is quite significant from the current version. Our guess is that if you have a Gold account, it will now reflect on the tile. When we asked Microsoft's Andrew Clinick about it, he was very coy giving us a "I have no idea what you're talking about!" with a grin. Real frunny guys! The second shot to the right, comes courtesy of Long Zheng/iStartedSomething of ChevronWP7 fame and was taken during the keynote (from his Flickr stream). It shows what the nex Xbox Hub may look like, with a smaller list view being shown. What other changes are there? We'll try to find out, but MS seems to not be revealing too much here.